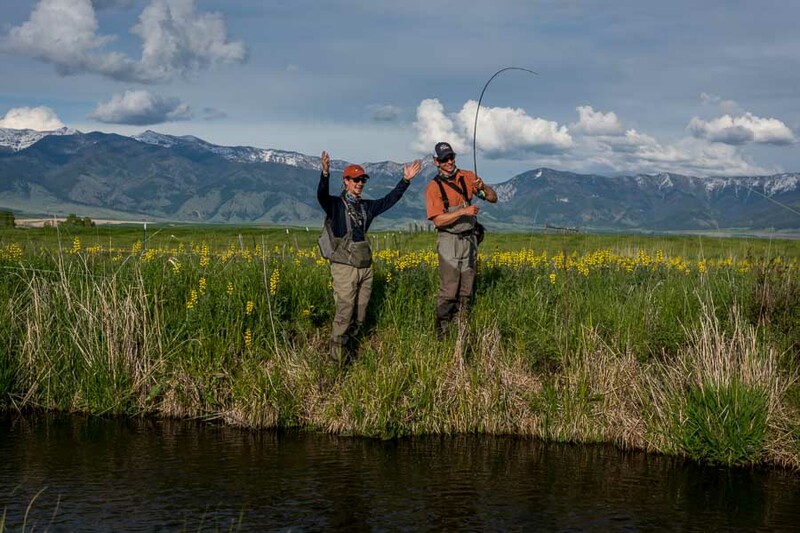 Montana is home to some of the world's finest spring creek fly fishing spring creek fly fishing. The broad valleys flanked by high mountains that are common across Southwest Montana allow springs to percolate up in the valley floors resulting in unique fisheries that are nearly ideal for wild trout. Because spring creeks have a constant water supply that is temperature regulated they support a density of aquatic macro-invertebrates that is much richer than the more common freestone rivers and streams. Since spring fed waters in Montana are at the mean annual temperature which is 48 degrees the water temperatures in spring creeks are warmer than surrounding waters in the winter and cooler in the summer resulting in high growth rates for trout. The large density of macro-invertebrates combined with crystal clear waters and smooth, glassy currents help to generate challenging fishing conditions and highly selective and spooky trout. 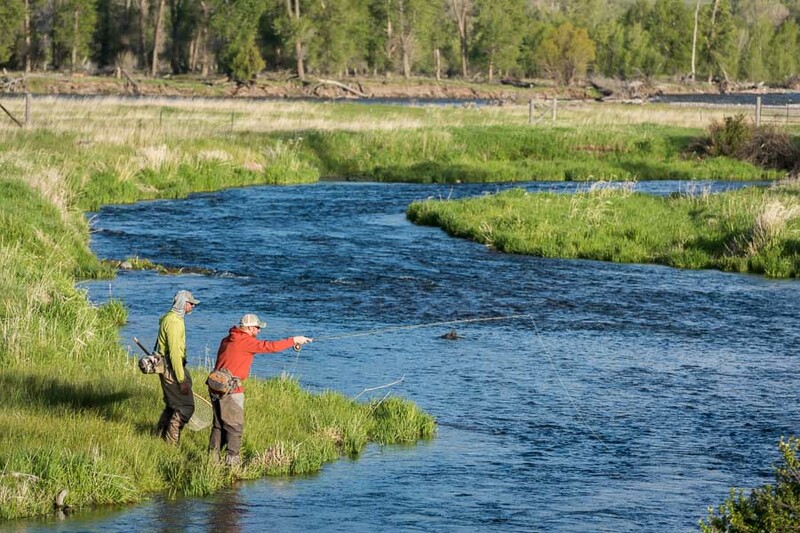 Spring creeks are widely considered to produce some of the most challenging fly fishing conditions in the sport. The difficult nature of spring creek fishing is cherished by many avid fly fishers that enjoy the chess match that unfolds on the water each day. Here are five tips that can improve your success rate on these highly technical fisheries. Although spring creek trout can be exceptionally spooky, it is still a good idea to get as close as you can before making a cast. Currents in spring creeks are complex and if you have too much line out it is very difficult to get a drag free drift on either nymphs or dry flies. When trout are feeding on the skinny flats, the minimum casting distance may still be a bit lengthy. When trout are in faster riffles or in deeper water anglers can get much closer to the trout. It pays to take your time and slowly sneak into position, avoiding wading if possible. We frequently hook spring creek trout with just a rods length of line out of the guides. The closer you can get to trout the better your presentation will be. The abundance of aquatic insects found in spring creeks is truly staggering. Since trout have so much food available to them they become notoriously selective during hatches. Fish will completely ignore any offerings made except for those that imitate the insect that is currently hatching. Fortunately spring creeks generally have a lower diversity of insect species which simplifies the process to some degree. What spring creeks lack in insect diversity, they make up for in sheer abundance of the species that are present. 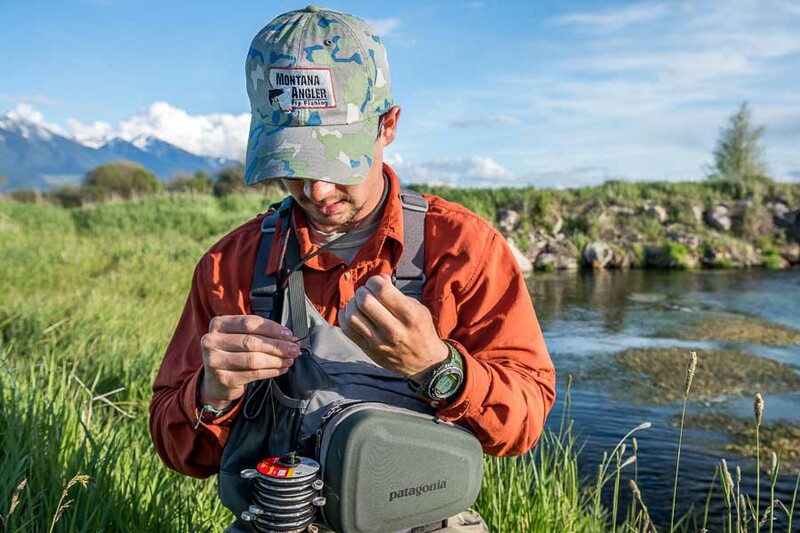 The most important hatches in most Montana spring creeks are midges in the late winter and early spring, baetis in the spring and the fall and pale morning duns in the early summer. Caddis flies can also play an important role in late spring and early summer on some spring creeks. Understanding when these hatches occur and the time of day of the emergence is critical to success. Since water levels and temperatures are so consistent the annual sequence of hatches is almost exactly the same from year to year on a given spring creek. Spring creeks are famous for their mayfly hatches. 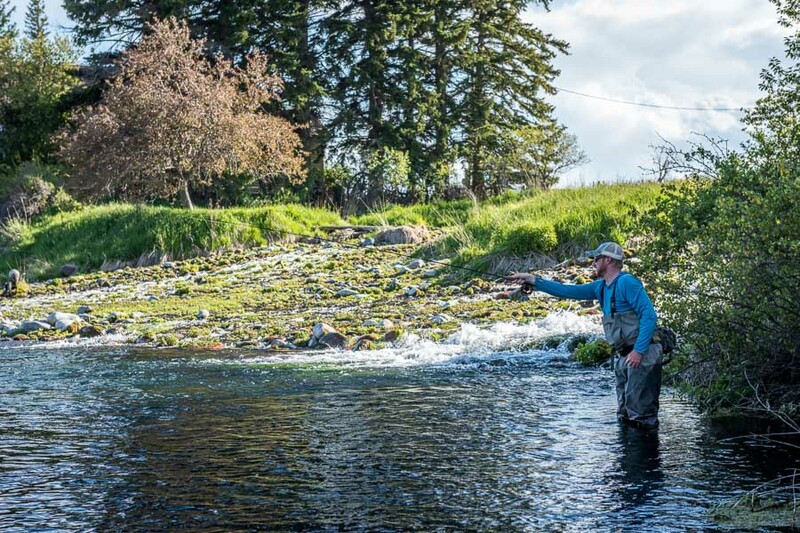 On Montana spring creeks fisherman can expect to fish over blue winged olives or pale morning duns during several months of the spring, summer and fall seasons. During thick hatches trout become very selective and often prefer to take emergers or crippled duns. We almost always produce more hook ups on emerger patterns than with traditional high riding duns. I prefer to fish several of the CDC patterns that lie nearly flush in the surface film. When spring creek trout are holding in deep or fast water traditional presentations of up and across for nymphs and dries are effective. When trout move into shallow glides during hatches it is more effective to position yourself directly across and slightly upstream from the fish. This allows your flies to move to the fish before they see the tippet and increases your hook up percentages. This casting angler also accommodates specialty casts like reach casts and curve casts that help present the flies first ahead of the leader. Since spring creeks are so productive in insect life, the trout populations are also much more dense than freestone rivers. Spring creeks are literally teaming with wild fish and it seems. One of the keys to consistently being successful on these technical waters is to search for runs that allow for a very good drag free presentation. Since the waters are often gin clear it can be difficult to pass up trout that you can observe aggressively feeding. Anglers need to learn to read currents on spring creeks and select runs that won't generate drag on both dry fly and nymph presentations. Once you find a run that allows for just the right drift line it will be a solid producer from year to year. Sometimes just moving your body position in a run a few feet upstream or downstream will change the geometry just enough to start producing hook ups.